Working as freelancers has its own challenges. One of them is to keep steady revenue and maintain a list of regular clients that will provide regular projects. As time went by and I read more professional sources of information and interacted more with fellow freelance linguists, I came to realize that what I had been doing was wrong. In order to get projects, I have to market my services. I can’t just sit down and hope I will get some work. I have to get the information out to the world that I offer services as a translator and interpreter. Otherwise, nobody would know about me, the services that I offer, my skills, and how to contact me if they need my professional help. That’s when I finally get the idea that MARKETING IS VITAL. It’s the core part, the backbone of the sustainability of my career as a freelance linguist. Long story short, I then started spreading the word to EVERYONE. When I make new friends, colleagues, or meet relatives, I make sure they know what I do and hand them my business card. Now, when I attend seminars and conferences, I always try to go around and greet people. That’s one thing that used to be my weakness: networking. Small talks will lead to people asking what I do for a living, so it’s the right time to spread the word. So, now you must want to ask: “Desi, is that all?” And my answer would be: NOPE. I’ve compiled a list below, and I hope it helps you diversify your marketing strategies. I’ve mentioned this as the first way to market your service., and it’s proven to be the most effective marketing strategy for me. Everywhere you go, never forget to let everyone knows that you’re a freelance translator and/or interpreter. Your neighbor might have a cousin who wants to study abroad and needs his/her diploma or other documents translated, and your name comes to mind when they need a translator. Well, you’ll never know who needs your service in the future. One thing to remember is that you have to let people know in the right way. Don’t come to people ONLY to hand them your business card. Start interacting politely and bring the topic as part of the conversation. In this digital age, everything can be found easily on the internet. Search engine is your best friend to get any information you need. Use social media as one of your marketing platforms. My main marketing channel is my website. I think it functions like an online resume and business card in one. I am also active on Instagram, Facebook, LinkedIn, and Twitter. I receive some queries from those platforms and I can say that they’re really helpful for my marketing. Specific hashtags, Instagram stories, and video feature in those applications can show potential clients what I do, how I do it, and kind of showcase my translation and interpretation skills. If you’re a freelance translator or interpreter, mingling with colleagues or people from the same or relevant industry is a must. You will get more opportunities to meet businesses or individuals that might need your service. Let’s say you’re a legal translator, you may want to attend seminars or conferences held by your local association of advocates. Attending trainings by local or national association of translators or interpreters can also be your way to market yourself. Other translators often get queries for translation which they don’t specialize in. So, if your specializations match the queries, then there’s a chance you’ll get offered a job. Again, you’ll never know, but you need to look out for such opportunities. 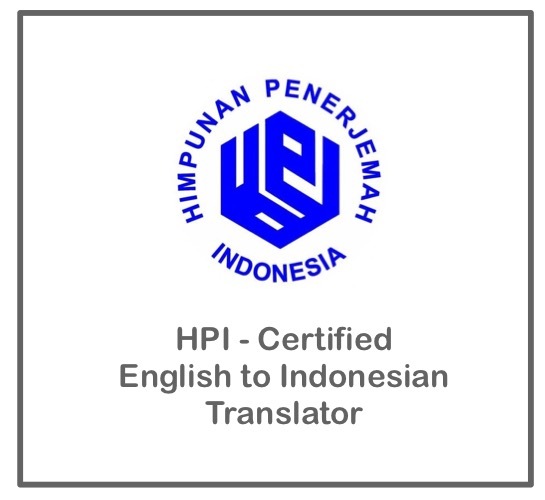 I started sending email offering my service to companies that might need English – Indonesian translators on the very first day I decided to become a full-time freelancer. I received some polite responses and some other have worked with me once or twice. If you prefer working with direct clients, you really need to focus on them. For example, if you specialize in oil and gas translation, you can send your CV and cover letter to oil and gas companies. You may not know that there are local organizations around you that sometimes require translators or interpreters. You can start working as volunteers for them if you’re just starting out. That way, you will get experience and more people will know about your skills. They will remember you and the next time they need translators or interpreters, your name will definitely be the first on their list. There are hundreds of thousands of translation agencies out there, and you can start from the nearest ones. If you live in Indonesia, type the keywords “agensi penerjemah” or “translation agencies in Indonesia”, or other relevant keywords of your choice to get a list of agency names where you can send your applications to. You can also register with online job portals and professional websites like ProZ, Translation Directory, or Translators Cafe. Many translation agencies are registered on those websites and you can do your research to decide which agencies you want to contact. Register on their online portals so you are listed on their database. When they have potential projects, you will already be listed and probably contacted by them. The more websites and portals you are registered with, the higher chance you will have to get projects. Event organizers often need more interpreters than translators. You can contact your local organizers to offer your service. Even if you don’t get a job from them straightaway, you will have the chance to be contacted if they already have your contact details and CV. As I mentioned earlier, you will get higher chance of being offered projects if you send your applications everywhere. Well, that’s all I have for now. I’ve tried all of them and honestly not all of them work as I expected. You could at least try before deciding which one suits you and develop your strategies around one or two of them. You can also get more ideas and inspiration from other freelance translators out there that you can follow on various social media and websites. Some of the best are Tess Whitty, Corinne McKay, and Dina Begum. Have you done any of the above? Or all of them? Do you have other strategies to share?